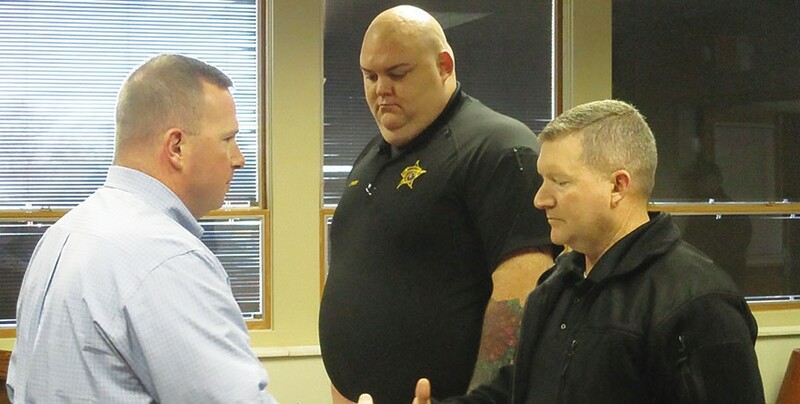 From left, Blount County Sheriff Mark Moon presents commendations for outstanding service to Sgt. Jeremy Rudy and Capt. Ron Adkins for their efforts over five days in recapturing an escaped prisoner from the Blount County jail. Following extended discussion of substantive items such as the state gas tax and the unit system referendum resolution in Thursday’s work session, the commission took no action on either of those matters in its Monday business meeting. Instead, it handled an agenda composed mainly of routine items, ending with a nearly two-hour-long executive session to discuss pending litigation and security matters for the county, as announced in the executive session recommendation letter. • a resolution in connection with a federally-funded project for striping, guardrails, and other safety improvements to designated rural County Roads 34, 35, and 36, along with a companion resolution covering the Alabama Department of Transportation funding agreement for the project. • an amendment to the Blount County Floodplain Ordinance, specifying the addition of definitions of the following words to the text: encroachment, floodplain management regulations, freeboard, hardship, post-FIRM construction, pre-FIRM construction, public safety and nuisance, non-residential, and obstruction. • a budget amendment of $3,542.70 to Palisades Park for additional public donations from the 2018 Christmas lights display at the park. • a District 2 request to purchase a new tandem-axle truck, with financing to cover the difference between proceeds from sale of current truck and the price of the new truck. • sponsoring a table for the Blount County Children’s Center annual dinner April 23 at a cost of $300; and a table for the Retired Seniors Volunteer Program annual banquet May 7 at a cost of $100. • authorizing a part-time animal shelter technician position at grade 4, step 1. • revision of the human resources policy related to hiring and promotions such that it matches changes agreed upon in last year’s budget meetings, but not incorporated in the policy manual at that time; effect of the revision is to allow commissioners to hire temporary workers for road projects without having to go before the full commission for approval. • declaring surplus two high-mileage Crown Victoria vehicles and donating them to First Battalion 200th Regiment at Fort McClellan – for training. • District 3 purchase of a Ford New Holland tractor and Alamo cutter from District 2, with accompanying transfer of $15,000 from District 3 to District 2 budget. • re-appointment of Russell Martin to Blount County Water Authority, retroactive to March, 2017, and extending to March, 2025; two other appointments effective March, 2019, to March, 2025, were deferred until the next business meeting. • declared surplus a District 2 1995 Ford tractor and authorized sale by best means possible. • purchase of utility truck for coroner from West Blount Fire District for $8,000. • developing a standardized contract for road work for all municipalities, to be mailed in October with memoranda of understanding for debris removal. • discontinuing county review of subdivision regulations covering area within the town limits of municipalities; county engineer will continue to sign for recording purposes only. • authorizing county administrator to survey local used vehicle market for medium-sized SUVs at moderate prices and to work with IT and engineering departments to identify and purchase. • authorizing county engineer to request bids for on-call guardrails. All four county commissioners and the commission chairman were present at the March business meeting: District 1 Commissioner Allen Armstrong; District 2 Commissioner Mike Painter; District 3 Commissioner Dean Calvert; and District 4 Commissioner Nick Washburn. Commission Chairman Chris Green presided. The next commission work session is Thursday, April 4, at 9 a.m. The next commission business meeting is Monday, April 8, at 9 a.m.